2017 marks the seventh year MedReps has conducted an annual medical sales rep salary report. According to the most recent research in 2017, the average medical sales rep total compensation is $147,424, with an average base of $95,791, and an average bonus of $53,405. As medical sales reps continue their adventurous climb throughout their career, they tend to reap the rewards both financially and in terms of job satisfaction. Request a monthly email with our latest articles and reports. This year, nearly 2,854 employed medical sales professionals participated in the survey. The majority of respondents (70 percent) were between 21 and 50 years old. Overall, the field of medical sales shows a wide range of age among current professionals. Experience widely varies among the respondents, as well, but the majority of them (54 percent) had between six and 20 years of experience. Approximately three out of four survey respondents travel for their medical sales jobs in some capacity, and a whopping 96 percent of them have at least a four-year degree. It’s also worth noting that seven out of 10 respondents are men. Just as climbers have multiple paths to the summit, medical sales reps have so many options to reach the top of their potential. While pharmaceuticals and medical supplies are the most popular products sold by the survey respondents, there are several other products that reps can sell. In fact, product is one of the biggest factors in determining medical sales rep salary. Reps selling health IT/software are the top earners, making an average of $176,012 in total compensation. The 2017 report also looked at how markets impacted earnings. 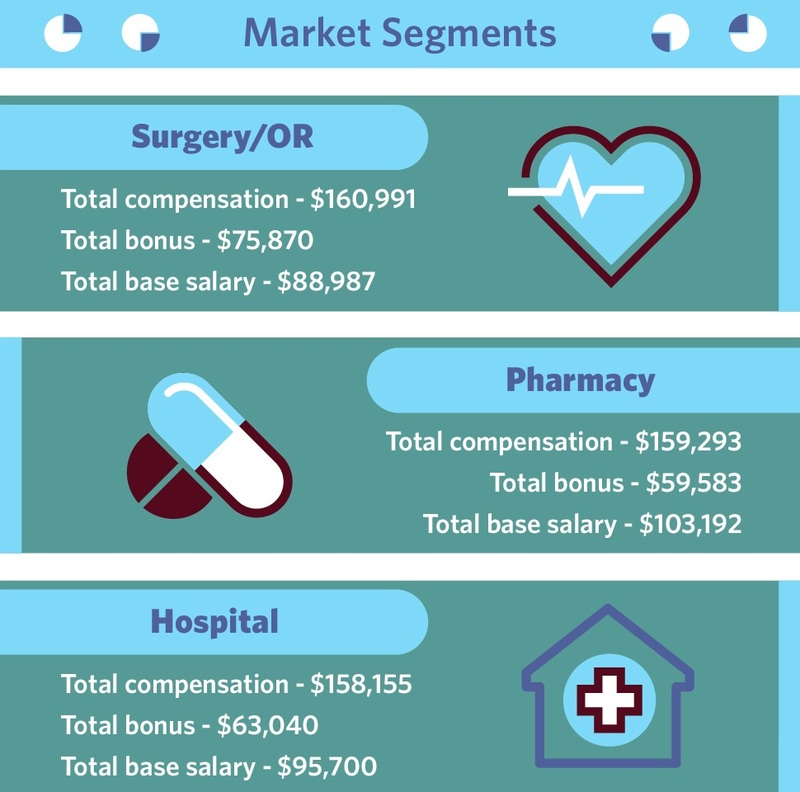 The top market segments included surgery/OR, pharmacy, and hospitals, and the lowest earners worked in nursing homes, home health, and rehabilitation. Unsurprisingly, sales directors and sales VPs hold the top spot with the highest average total compensation, earning $207,053. Sales management and national accounts followed closely behind, with an average total compensation of $185,696 and $185,307, respectively. The size and type of employer also has a big impact on salaries. The highest earners, who make an average of $156,730 in total compensation, work for large manufacturers. In fact, no matter the size of the employer, manufacturing pays the most. Distributors pay the second most, followed by service providers. Those with over 20 years of experience make a lot more than rookies — their average total compensation is $168,983, versus $101,175 for those with less than two years experience. However, these scaling numbers can be encouraging for professionals who are new to the industry. Similarly, professionals over 61 years old earn nearly $50,000 more in average total compensation than their 20- to 30-year-old counterparts. Yet, those in their 20s still enjoy a comfortable income of $101,175. Similar to previous reports, men make up the majority of medical sales. In fact, just 30 percent of respondents are female. Women are outnumbered and earn significantly less than men. They make just 83 percent of men’s average total compensation. Their commission and base salary are also well below their male counterparts. Most respondents (87 percent) identified as White/Caucasian, which is a clear indication of the lack of diversity in the medical sales world. What’s more astounding is the lack of Hispanic and African American professionals – they made up just 4.4 percent and 3.9 percent of respondents respectively. It’s also important to note that white medical sales professionals make up the majority of top earning positions – 90 percent of sales management, 92 percent of sales director/sales VP, 90 percent of national accounts, and 87 percent of sales (field). The survey also found that, generally speaking, the more you travel, the higher you climb. Professionals who travel tend to earn a generous amount more than those who don’t. In fact, those who don’t travel earn $83,799, the lowest average base salary. However, their average total compensation is a generous $129,876. Their average total compensation is far less than those who travel 10 percent of the time. They earn $142,717, and those who travel 50 percent of the time make $169,669. Location can also have an impact on earning potential. 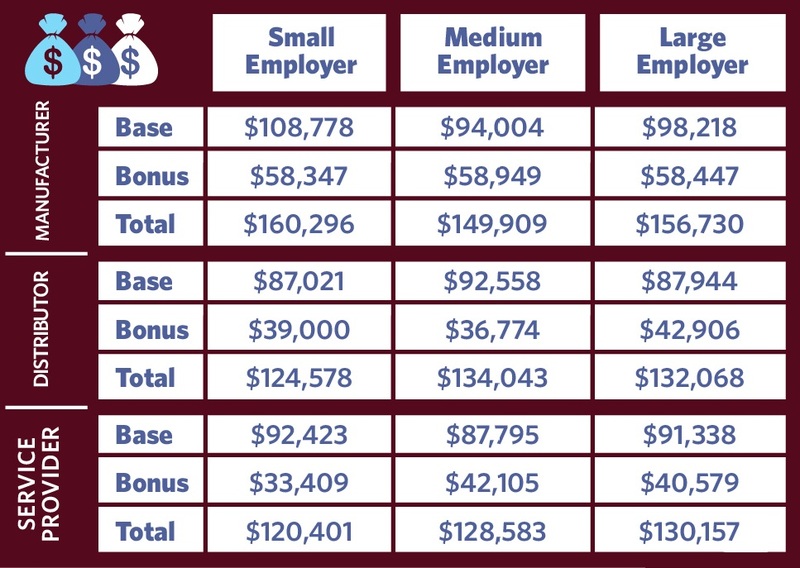 The following chart looks at the top ten states with the most survey respondents and what the average total compensation is in each state. Total compensation increased in Florida, California, Ohio, New York, and Georgia since 2016. In fact, the field of medical sales has enjoyed a consistent increase in salary over recent years. 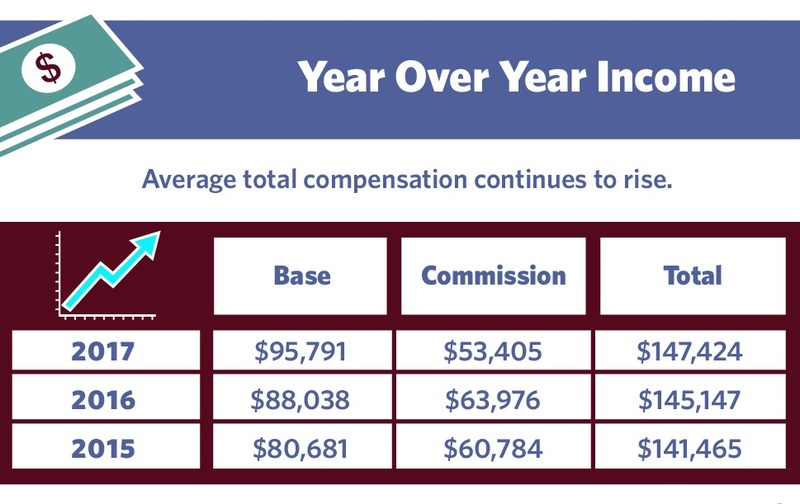 As you can see, over the past three years, there has been a steady climb in average total compensation. While commission dipped since 2016, base salaries saw a big boost. Compared to last year’s report, all of the perks, except for stock options, slightly increased in popularity among survey respondents. While climbers seek out the dangers and challenges of pushing themselves to their personal limits for the sake of satisfaction, the question remains – do professionals who work in medical sales like what they do? It turns out, a large majority are happy in their careers. While six-figure paychecks and perks aren’t the most important aspect to consider, they certainly play a major role. In fact, 43 percent of top 20 percent of earners are very satisfied with their compensation, whereas just 19.5 percent of the lower 80 percent of earners can say the same. That being said, overall, 76 percent of all respondents are satisfied with their compensation, and 77 percent are satisfied with their overall job. For more information on medical sales salaries and the medical sales jobs that pay them, stay tuned into MedReps.com.